FILE - Gabon's President Ali Bongo addresses reporters at Nairobi National Park near Nairobi, Kenya, April 30, 2016. Gabon President Ali Bongo is facing a tough challenge in his bid for another term in office. The runup to Saturday's vote has been tense, with the opposition questioning Bongo's citizenship and eligibility. Ten challengers are vying to end nearly 50 years of rule by the Bongo family during the one-round presidential poll. The results may hinge on popular discontent over the state of the Gabonese economy, which relies heavily on oil revenue and has been deeply affected by the drop of oil prices in recent years. Gabonese economic analyst Mays Mouissi said the state budget has shrunk, so cuts have been made in such areas as investment and credit. "Companies have been laying off staff, and there has been quite a number of social conflicts,” he said. While the opposition blames the government’s inability to diversify the economy, Bongo remains confident. He noted that his government had built 700 kilometers of roads and a wider electricity network. The son of Gabon’s longtime leader, Omar Bongo, took over the presidency from his father in 2009 after a disputed election. FILE - Jean Ping speaks to reporters in London, Feb. 23, 2012. 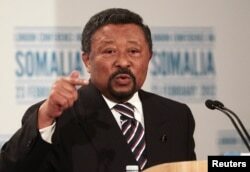 Bongo’s main challenger is Jean Ping, 73, a former African Union Commission chairman. The son of a Chinese immigrant, Ping is a former ally of Bongo’s father. He was a minister in Omar Bongo’s governments and even married his daughter. He switched over to the opposition in 2014. Jean-Gaspard Ntoutoume, Ping’s campaign communication officer, said there had been a major setback in Gabon in terms of individual freedoms, and he also alleged that corruption had been a problem within the government. Three other major opposition candidates have rallied behind Ping over the last few weeks. Analyst Mouissi said that could be a game-changer. “For once, the opposition has a real chance at winning,” he said. A few weeks ago, the opposition tried to call for the disqualification of Ali Bongo’s candidacy, saying he'd faked his birth certificate and had been born abroad. Police violently broke up a protest in the capital, and Bongo remains on the ballot. The electoral campaign ends Friday. Results of the voting are expected next week.